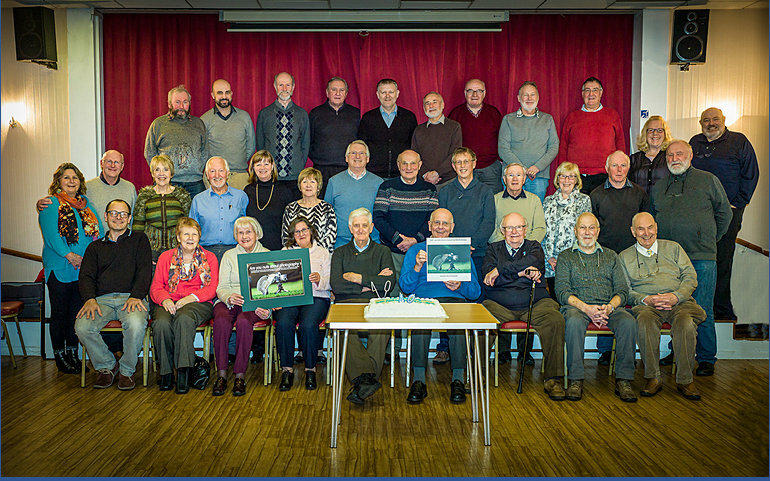 40 years after its inaugural meeting in Winsford Library, 36 members of the Mid-Cheshire Camera Club judged their ‘small prints competition’ and then enjoyed a buffet prepared by staff at the Dingle Recreation Centre. One founding member plus several long-standing members cut a 40th anniversary cake. The occasion was also marked by the unveiling of a 40th anniversary photo-book comprising 125 images from current members spanning work from the 1980s through to 2015. The photo-book was eagerly anticipated by members who agreed that the variety of images and quality of printing had made for an invaluable permanent record of the club that started with about a dozen members back in 1976 when it was called the Winsford Camera Club. Membership has fluctuated over the years and currently stands at a comfortable 40 and thanks to the steady hand of club Treasurer Nick Harris, it has never been more financially healthy. The Lottery and Town Council have also played their part with funding for a much needed digital projector. When asked how the club had changed over the years, Andy Adams, former club Secretary and Treasurer who joined in 1982 said that the club has always had many excellent photographers but while they used to do their own film developing in the club’s dark room, today members process their images using computer software such as Photoshop. Chris Prior, member since 1992 said that the club’s programme is much more varied these days with lecturers providing lots of tips and techniques and added that the introduction of the club’s website has done a lot to increase membership over recent years. When asked for his opinion of MCCC, new member Paul Wilcock who joined with his friend in October 2015, said he wished he had joined years ago as it is making him think about his photography in ways he would never have dreamed of. Thanks to the regular competitions where judges critique and score members’ images he now seriously considers subject matter, composition, lighting and what he can do once he has taken the shot to make it really stand out. He said MCCC members had made him very welcome and he and his friend Richard Morris look forward to learning even more from the many experienced photographers within the club. Current Chairman, Ray Hill added that his aim during his three year term has been to provide a relaxed and stimulating environment to help members to improve and most importantly enjoy their photography. Here’s to the next forty years! For more information about the Mid-Cheshire Camera Club visit its website www.midcheshirecameraclub.org or come along to a meeting on Wednesday evening at 7.45 for 8 p.m.at the Dingle Recreation Centre, Winsford. Pictures by Press Officer, Ken Hewitt.